I started running marathons in the year 2011. The initial years were full of running too many miles, often junk. The urge to improve was natural and it was then that I realized that a running coach was essential. Running was no longer just a hobby or a fitness activity, but a sport with lofty goals to attain. The journey since 2016 has been one of a pursuit of a goal – To qualify for the Boston Marathon – The oldest and the most prestigious world marathon. After a dream run at the Mumbai Marathon 2017, improving on my personal best on that course by an unexpected 20min, I first BQ’d by a margin of 1min 31sec. The crown of BQ that one yearns for soon starts feeling like one of thorns when year after year, one is denied entry due to a slower timing. In the two years that followed, I had qualified for Boston in four races but wasn’t fast enough to make the cut during the registration process. Readjustment of the qualification criteria to 5min faster timing made it worse with the run at Chicago (Oct’18) falling short of the new qualification timing by a nasty 44 sec, and there came off the crown. The thrill of running my first world major at Chicago was drowned in a feeling of disappointment, despair, anguish and introspection. What evolved out of all the mind games that ensued in that intervening period of recovery and a short meeting with coach was a quiet resolve to give it my best shot at Mumbai. Although a tough course due to its elevation, the humidity and relatively warmer temperatures, my positive thoughts persuaded me to recall that run in Jan 2017, when I had exceeded all expectations by clocking a huge PB to BQ on this very course. 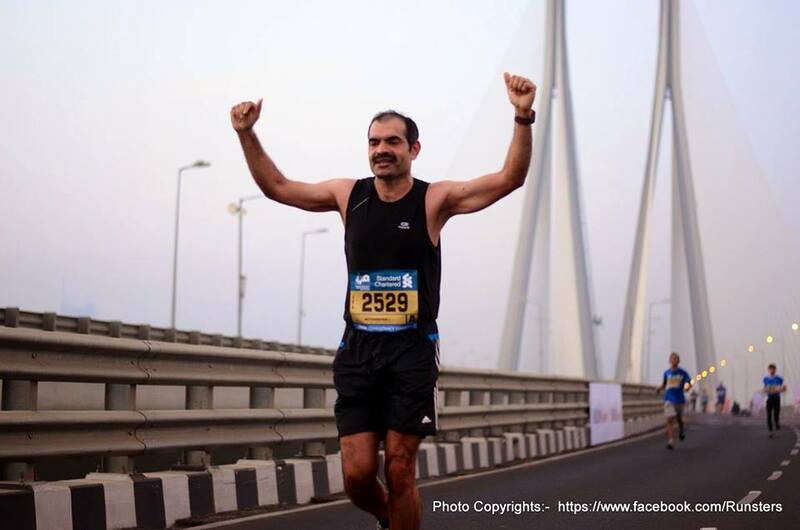 I decided to go back to Mumbai with this resolve and with Ash Nath ( my coach) offering to pace me in this race, I knew this was my best chance if I could make the most of it. A training plan was crafted, keeping in mind what I lacked in converting potential to performance with focus on improving the endurance, maintaining pace and effort during the last 10k and “changing gears”, which meant the ability to increase the effort and pace towards the crunch stretch of the race. The training plan was designed with a greater number of long runs, some of them at near race pace, and some of them, with short surges of running fast followed by slower (race pace) longer stretches to build up the much-needed lactate threshold. Long intervals at faster than race pace, with short pause in between helped work on the speed and also built up capability to run faster on tired legs. Flat and cold Delhi helped me stick to these target paces. Hydration and fueling with gels and energy drink-BCAA combo was planned well with running in loops to take them at regular intervals or run with these in hand. Each of these long runs was done with a previous day preparation as close to pre-race day feel. The difficult part of working on the mind to convert the training efforts to race day results was left to me to figure out. The best way to move ahead in such tricky situations is to look back and see how you reached where you have. I went through all the Garmin data since 2015, the year I had acquired one after having run FMs for 4 years, in those classic “timeless” days. Most of the improvement in timings had happened in the second half of the race, with some slowing of first half to save energy. Over the past 2 years, in the race reports to Ash, what the mind was thinking at each point in the race was also recorded, which helped visualize the race and think of solutions. While the initial 8k passes off, fueled by crowd energy and upto 15k mark in a steady effort often faster than planned, reality of the course only hits around half way mark when fatigue strikes. Saving energy for this part of the course, remaining mindful and consciously increasing effort to stay close to target pace and reaching the Peddar road hill with enough to spare is the key. The last 6k thereafter, is a segment where mind has to be alert and let the heart take over to run this last stretch with whatever left in the tank. The run up to the race day included two clear days of rest and acclimatization to the Mumbai weather. A short run through the tricky last stretch was done on Friday to get the necessary confidence. Hydration across Friday and Saturday with carb loading was done religiously. Race day preparation included early morning light top-up of the usual bread and jam, hydration with electrolyte and BCAA drink till start of the race, and a 500ml bottle to tide over the initial stretch without wasting time at water stations. Gels and salt capsules were consumed at usual 35-40min intervals, except that this time an additional gel between 24-35k mark to ensure better fueling and not letting it wait till the end, where it might be too late to refuel. Proper cooling with water and ice-sponge, and running tangents mindfully under Ash’s guidance helped shorten the course to near exact distance. Constant reinforcement and self-motivation with thoughts of a positive outcome. Taking energy from successful training workouts, watching videos of kipchoge, Mo, and other elites and listening to their interviews helped build up the tempo. Even a brief halt and a prayer on the lips in front of Haji Ali and the Babulnath temple during the run on Friday wasn’t spared, to get whatever divine help one could manage. Focus, mind on target and a determination to not let it slip by this time. A warm and humid start to the day played on the mind, but was safely pushed aside as a variable, not under control so not to be worried about. Plan was to stay mindful all through the race, not overdo in the initial stretch, and consciously work on the basics of breathing, form and cadence as the going got tougher. In the stretch of 24k-36k where pace faltered and one gave up in all the previous attempts, aim was to stay close to target, and push through the pain, in anticipation of reaching the last lap, where the energy of getting to the finish line would take me through. Though mind did waver and few stops happened, but the strong urge to perform and realizing that the next opportunity to make it happen wasn’t anywhere near, made it a do or die situation and made it easier to pick up the pace and rush towards the finish line. It’s an exhilarating feeling, having achieved the target I trained for after having toiled for more than two years, hovering around the mark. Looking back at what I did differently this time, I really wonder. I started planning with a sense of dejection that led to determination and a silent resolve. Working under coach’s guidance, the training was modified to include aspects that addressed the weak links. Lessons were drawn from the data and notes from the previous race reports. Segments of race where one gave up were identified and a conscious effort was made to push through those miles with stronger will. Training paces and mileage built up the necessary confidence to do so. Mind was exercised in making its own route map and “fueling stations”, where it was likely to falter and required a stronger push to get through. Mantras which helped tide over these spots and firm words from the coach whenever I seemed to be giving up, ensured a quick recovery and faster finish. These last few years in pursuit of this elusive target have convinced me about the importance of believing in oneself and one’s training, learning lessons from the setbacks, putting head down and going ahead with determination and perseverance. This has given me the confidence to achieve tougher targets and ability to overcome the challenges not just in running, but life itself. Please mention your splits and respective timings. Col. Dr. Muthu Sir, first I want to congratulate you for the feet that you achieved. No doubt the combination of hard work and proper training plan along with Ash really an achievement. A lot of significant points are take away for us. I wish great success ahead ! !